The 4D Intelligent Display Module uOLED-128-G2 is a compact and cost-effective display module that utilizes the latest state-of-the-art Passive Matrix OLED PMOLED technology. The embedded GOLDELOX, a highly optimized virtual-core-engine graphics processor delivers stand-alone functionality to any project, allowing for a variety of applications. The uLCD-32PTU is a compact and cost-effective Intelligent Display Module packed with plenty of features, ready to become the GUI for your target application, and capable of being an interface controller for a number of applications. The uLCD-32PTU is driven by the PICASO graphics processor, which is driven by a highly optimized virtual core engine called EVE Extensible Virtual Engine. An extensive range of hardware and software peripherals have been integrated into the design to give the user the freedom to adapt the module to suit almost any application. The SK-32PTU is the perfect option for a first-time 4D Systems user. The SK-32PTU is a starter kit that includes a uUSB-PA5 Programming Adaptor, 2GB micro-SD card, and the uLCD-32PTU. The uLCD-32PTU is driven by the PICASO graphics processor, which is driven by a highly optimized virtual core engine called EVE Extensible Virtual Engine. An extensive range of hardware and software peripherals have been integrated into the design to give the user the freedom to adapt the module to suit almost any application. 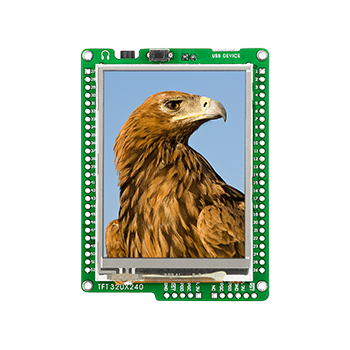 The Picadillo-35T is a 3.5” 320x480 resolution (Half VGA) Embedded Display Module with Resistive Touch, featuring the Microchip PIC32MX795F512L 32-bit microcontroller and Arduino™/ chipKIT™ style headers for easy attachment of shields, and compatible with UECIDE, MPIDE and MPLAB X Programming IDEs, making this a brilliant display solution with open-source software. The Mikromedia Board for PIC24 is a palm-sized unit with amazing multimedia capabilities. Based on the PIC24F256GB110 with USB On-The-Go (OTG), it includes a 320 x 240 TFT display with touchscreen, stereo MP3 codec, 8-Mbit serial flash, microSD card slot, headphone jack, and USB connector. Powered by USB, the board can easily play MP3 files from a microSD card with full 320kbps quality. The mikromedia Workstation v7 (MIKROE-1189) is a development station for use with the following mikromedia boards: TMIK009, TMIK010, TMIK011, TMIK012. Simply plug in your micromedia board (sold separately) and begin development using the extensive on-board features.